Your choice of contractor has the potential to make or break your project. Make sure you choose an experienced contractor like Cabinet Magic for your Kitchen remodeling in Orange CA. Cabinet Magic is a licensed contractor with the skills and experience required to guide remodeling projects of any size or complexity to completion. We seriously care about client satisfaction and we will work hard to make sure you love your new kitchen. Going for a bold new look with kitchen remodeling in Orange CA can be exhilarating. But you may also feel a little bit worried. What if the finished design doesn’t turn out like you expected? At Cabinet Magic, we never want our clients to feel worried that they’ll be anything less than thrilled with their kitchen remodeling in Orange CA. That’s why we always bring proposed kitchen designs to life using 3D rendering software. You’ll be able to see and approve all aspects of the design down to the last detail before we begin work. Most people opt for custom cabinetry because they want a truly unique look with cabinets perfectly suited to their style and their space. But custom cabinetry also delivers another very important benefit: custom functionality. At Cabinet Magic, we have almost 30 years of experience in crafting custom cabinetry. We can custom fabricate any size cabinets with any combination of doors, drawers, roll outs, racks, and other storage accessories, and of course you will have your choice of styles and finishes. Our cabinets are made to withstand daily use with ease and grace with features like soft-close hidden hinges and smooth drawer slides. 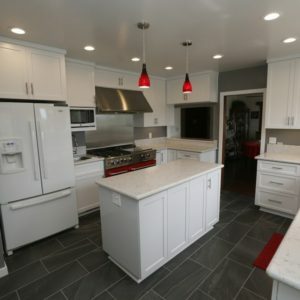 If you are interested in working with Cabinet Magic for your kitchen remodeling in Orange CA, please give us a call at 800-828-4380so we can set up a free in home consultation with one of our knowledgeable team members. We can help you price the upgrades you want and give you a free estimate.